It’s still early days for this Online Museum, which has only recently made its debut in a very small corner of the infinite cosmos of cyberspace. I’ll add interesting communications here to keep the museum ‘live’ so if you have any reminiscences you’d like to add for public consumption, please do email me (my email address is inside the photo at the bottom of the page). Just found your Warrick on-line museum. Excellent. I remember the faded lettering high on the south facing gable end which proclaimed Monarch Cycle works and always wondered about it. I used to take wheels in there for stove enamelling and parts to be chromed and also it was the only or first place in the area to undertake aluminium arc welding and the welder worked in a large Faraday cage, like something out of “The Time Machine”. 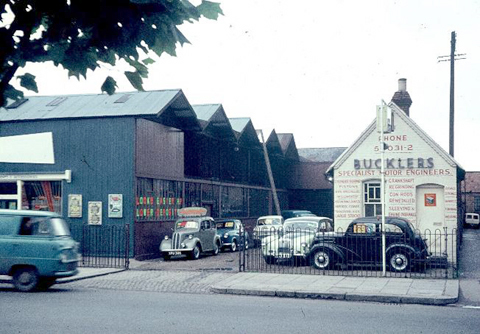 My father ran Bucklers at 67 Caversham Road where the first Buckler car was made in 1947 but like Warricks, few people appreciated the engineering which was taking place under their noses. 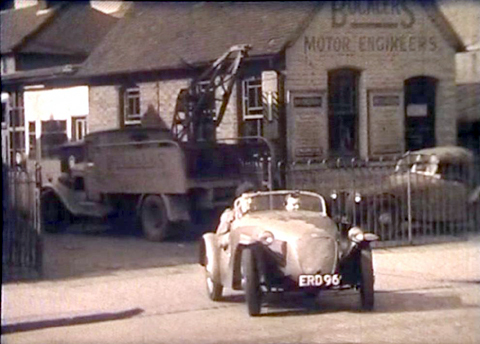 I enclose a photo from 1950 of Buckler sports cars at 67 Caversham Road. 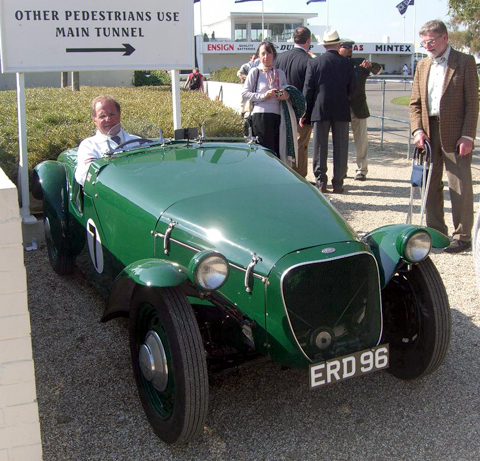 ERD 96 is now fully restored and appeared at the Goodwood Revival this September. The company my father purchased from W.J. Barkus in 1939 was, I think, the “Barkus Light Engineering and Aircraft Company”. This then became simply Bucklers and later Bucklers of Reading. There was only the cobblers shop and Brown Bros between us and Warricks. Bucklers did not own that premises but rented it from Stevco Ltd., as did Mr Barkus who continued to trade next door. Fancy you saw the Buckler ( ERD) at Goodwood . Great. It is owned by a Frenchman, Johan Letoquin and has been in his family since he was a child in the 1970’s. . He is not a professional but did the entire restoration DIY, learning as he went, including the auluminium body and got a tig welder for his birthday. He spent the whole summer finishing it ready for Goodwood but was turned back at St Malo, passport expired, would you believe. His best friend was coming over as passenger so the father of his best friend came in his place. It is the father, Jean Autret, sitting behind the wheel, they are all old car enthusiasts, the father has a 1922 Matisse and the best friend a1920’s Citroen lorry plus various old French motorbikes, Terrot etc.. I have another photo of Bucklers at Caversham Road which I will attach. That has also been on the forum in the past and, as you can see is early 1960’s. Here’s a press-cutting from Simon’s excellent Buckler website (link above), with a period ad that shows the address of Bucklers at 67 Caversham Rd.